1 Line a pudding bowl with two layers of clingfilm, leaving enough hanging over the edge to cover the sides. 2 Scoop the ice cream into the bowl. Fold the excess clingfilm over the top and press down with your hands to compress the ice cream and remove any air holes. Place the bowl in the freezer. 3 Preheat the oven to 180˚C/160˚C fan/gas mark 4. Lightly grease the sides of a cake tin with butter and line the base with a disc of baking parchment. 4 Melt the chocolate in a heatproof bowl over a pan of gently simmering water. Remove from the heat and set aside. 5 In a large bowl, cream the butter until soft. Add the sugar and beat until light and fluffy. Gradually add the eggs, beating constantly. 6 Beat in the melted chocolate, then fold in the flour until combined. Pour the batter into the prepared cake tin and bake for 25-30 minutes, or until a wooden skewer inserted into the centre comes out clean. 7 Remove the cake from the oven and turn the temperature up to 220˚C/200˚C fan/gas mark 7. 8 Allow the cake to cool in the tin for 10 minutes, then remove from the tin and place on a wire rack to cool fully. 9 For the meringue, whisk the egg whites in a large, clean bowl until stiff peaks form when the whisk is removed. Slowly whisk in the sugar, whisking well between each addition. Continue to whisk until glossy and very stiff peaks form. 10 Once the cake has cooled, place it in the middle of a flat baking tray. Remove the ice cream from the freezer. Use the cling film to pull the ice cream from the pudding bowl and place it upside down on the cake. Peel off all of the cling film. 11 Quickly spoon over the meringue, spreading it thickly and in peaks over the ice cream and the sides of the cake right down to the bottom. 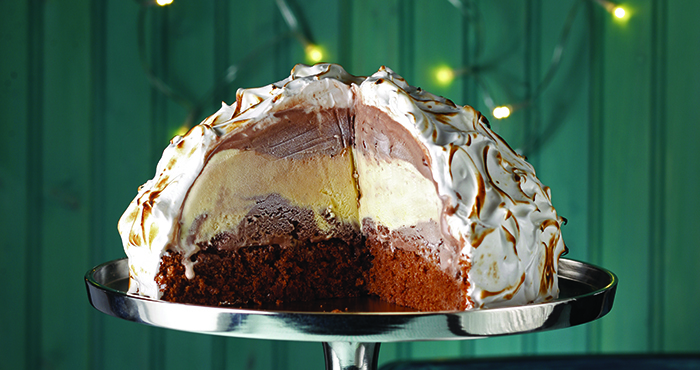 Return the baked Alaska to the freezer. 12 When ready to serve, place the baked Alaska in the centre of the hot oven for 6-8 minutes, or until the meringue is set on the outside and the peaks are turning light golden. 13 Carefully transfer to a serving plate, using a palette knife dipped in hot water to help you slide and push it onto the plate.